I have been nominated by the party membership to contest the next general election. 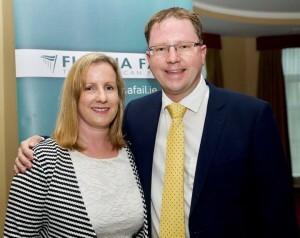 The selection convention held in the Westrgrove, Clane selected two Fianna Fáil candidates to run in the next general election. It is a tremendous honour for me to be nominated by the members in Kildare North to contest the next election on behalf of the party. I would especially like to thank those cumainn that nominated me including Kill, Sallins, Naas, Prosperous, Carbury, Kilshanroe, Kilcock and the Old Carton cumann, Maynooth as well as all the individual party members who placed their faith in me again. Since my election to Dáil Éireann 18 months ago I have represented my constituents on a daily basis fighting for better services in Kildare North and nationally. I have worked hard for the party, the constituency and the country during this time. Services are much needed in Kildare North. One major issue in my offices in Maynooth, Naas, and clinics elsewhere is housing. I have repeatedly raised in the Dáil the fact we need more houses. I agree with my party leader Michael Martin TD that the solution to this housing crisis is straightforward, the state needs to build more houses. In the 40’s and 50’s we built houses and there is nothing stopping the Government of today doing the same. Better public transport is a must for the sheer amount of commuters in our County. When the Dáil is sitting I travel by train to Pearse Station using my LEAP card to get to Leinster House. This is something which could not have been done 12 months ago. Following my meetings with Irish Rail and the NTA the short hop zone was extended to included Sallins and Naas making this commute quicker and cheaper for residents on this route. I am aware more work is needed across Kildare North in terms of transport. I am working on park and ride facilities, extra bus routes, and keeping pressure on the M7 and Sallins bypass works. To achieve these objectives and more we need Fianna Fáil in Government and to make Taoiseach Michael Martin a reality. I aim to do my very best to make that happen in the next Dáil and at local level to continue to work for our towns and villages in Kildare North.